TAP Portugal flies to 88 destinations in 38 countries, including New York and Miami in the United States. The airline has received several awards over the years for its excellent service, including the World’s Best Airline from Condé Nast Traveller magazine. Because it’s a Star Alliance member, its frequent flyer program, Victoria, can get you almost anywhere. Victoria is a region-based program that offers both off-peak and high-season redemption levels. Flying during the off season and on TAP Portugal’s own flights will generally get you the most value for your miles. TAP Portugal imposes fuel surcharges on its own flights and on some partner airlines. Award flights between the U.S. and Portugal, for example, include a $126 surcharge each way. The carrier also charges a 10 euro fee for booking online, 25 euros for booking by phone and 50 euros for changing an itinerary. How Can You Use Victoria Miles? The airline refers to its reduced-fare off-peak periods as the Saving Seasons. Although the exact schedule is a little more complex, most of the high season takes place in the summer and over the winter holidays. Off-peak flights between the U.S. and Europe are about 10,000 miles cheaper per roundtrip for both economy and business class. There are no seasonal differences for redemptions on Star Alliance and other partners. You’ll get the best value for your Victoria miles by flying on TAP Portugal during the Saving Seasons. For example, you can get a domestic award flight in Portugal for only 7,500 miles roundtrip, or a flight between the U.S. and Portugal for 50,000 miles in economy and 90,000 miles in business. Also during the off season, business class flights between the U.S. and South America on Star Alliance carriers are only 90,000 miles roundtrip, and between the U.S. and Oceania are only 130,000 miles. Both are excellent redemptions. Victoria lumps Alaska, Hawaii and the continental U.S. into the same region. That can work in your favor when traveling to and from those states. For example, U.S.-based frequent flyer programs usually charge more for flights from Alaska or Hawaii to Europe than for flights between Europe and the lower 48. That’s not the case with TAP Portugal. Unfortunately, most economy class awards on partner airlines are overpriced. At 70,000 miles, Victoria charges at least 10,000 miles more for flights from the U.S. to Europe than any of the major U.S.-based programs. Flights to Asia are even worse. 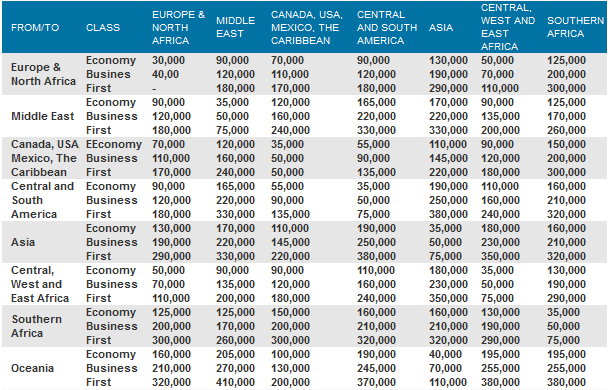 Most airlines offer business class tickets for less than the 130,000 miles Victoria charges for economy. You can upgrade cash tickets on TAP Portugal from economy to business with miles. A one-way upgrade between the U.S. and Portugal costs 20,000 miles. Not all fares qualify for upgrades, and you cannot upgrade award tickets. TAP Victoria has a base membership called Miles, and two elite levels: Silver and Gold. They correspond to the Star Alliance’s Silver and Gold. There are no U.S.-based TAP Portugal co-branded credit cards.